A couple of times a season there are the shore-based passbys where everything just comes together - you're in the right place at the right time with camera (and fully charged battery) in hand when the whales not only pass close to shore but are active and playful. This afternoon was one of those times. Sexual activity often accompanies this type of socialization, especially when multiple pods are present. The whale on the right is on his back, pec fins in the air, and his partially extended pink "sea snake" is visible. Interestingly, there was a little calf right in the middle of all of this, who is seen surfacing on the left! 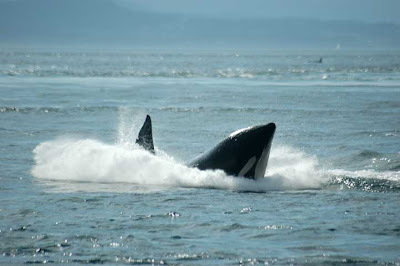 Orcas, like most dolphins, are not only promiscuous breeders but social ones as well, being the only group of animals outside of the great apes to engage in sexual behavior for the sheer pleasure of it. Sometimes only one or two whales will pass right close to shore, if any do at all, but today group after group of them came right by us. Next was part of the K13 family group traveling with the J14s. 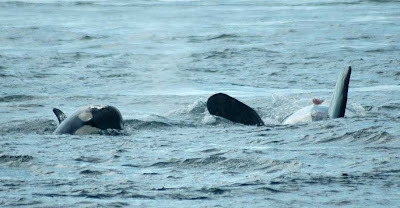 The two matriarchs surfaced together here, with K13 Skagit tailslapping right beside J14 Samish. Also, since I know not all my blog readers are familiar, I should explain the names of the whales a bit more. 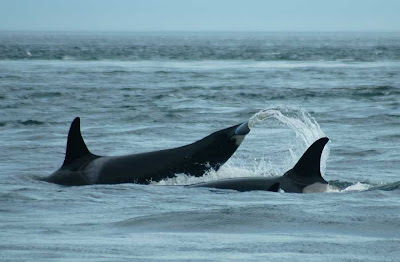 The Southern Resident Community of killer whales is a population comprised of J-Pod, K-Pod, and L-Pod, who all together total 85 animals. 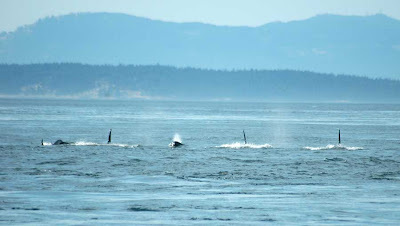 These whales hang out off the coastal waters of Washington and British Columbia pretty consistently from May-September, feeding on the salmon that are running to the Fraser River just north of Vancouver, BC. Every whale is given both an alphanumeric designation (J1) and a name (Ruffles). 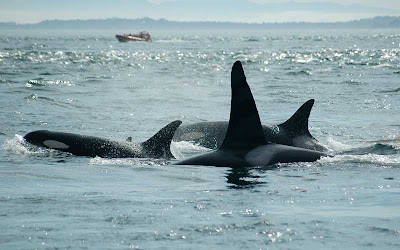 The alphanumeric designation indicates the order in which they were identified in their pod, so J1 was the first whale identified in J-Pod, and new calves are given successive numbers added on to that, so the new J-Pod calves this year are J44 and J45. After a whale survives its first year of life its given a name through The Whale Museum as part of their Orca Adoption Program. Every pod is essentially a family group made up of several related matrilines, and a matriline is a female and all of her offspring. 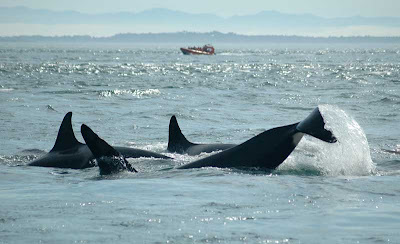 So when I talk about the J14s, for instance, I'm referring to J14 Samish, (the mom) and all of her offspring. Fascinating stories and great photos, Monika. It's hard to describe a typical day in the lives of the orcas because they're so different every day. This gives some great glimpses. The calf breach shows a little flexibility in the neck. It looks like he or she is looking at you. All this amazing activity and behaviour and the 'Orcacam' still isn't working....ARRRRGGGHHHH. Might have to book a day or two off, pack my tool box and come and fix it myself! Our reserve is investigating an underwater camera to spot the fish, diving ducks etc - should be interesting, live feed to visitor centre only at the moment; don't know if it'll ever go on the web - hope so. Awesome images! Especially the close breach. Beautiful. It must be breath-taking to see so many and all that action. Delightful. Thanks for all the interesting info. 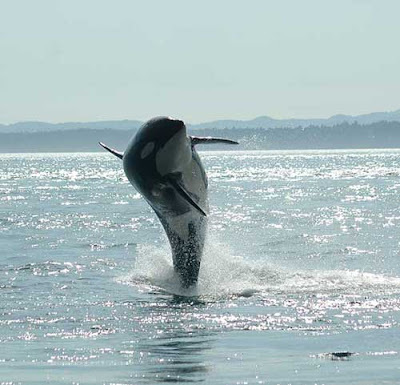 That ''leaping'' killer whale really is a stunning photo Monika. I bet your well pleased with that. You have some wonderful material here, Monika. Nice work all around. I'll take it a step further than a previous poster, and say that the whale-in-air shot in particular is nothing short of amazing. Stormboy - Thanks for stopping by and commenting! That's always been my goal, to give a glimpse into the lives of the orcas through photography. Dave - No idea what's up with Orcacam this year! If you come out to fix it yourself you might as well stay long enough to see the whales in person ;) An underwater camera to watch diving ducks sound amazing! Vickie - The whales are pretty much breath-taking on a daily basis! Thanks for the compliments. Warren - Most definitely! There's a whole sequence of 4 photos that go along with it. Thanks Michele! I'm always glad to share. Brient - Thanks so much. That always means a lot coming from a fellow photographer! 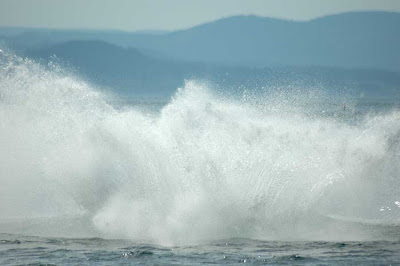 Wonderful photos, greatly enjoyed a visit to your Blog. Please keep up the education it is the only way to make effective change.